Previously, I looked at President Aria’s actions as being something to look at while others are talking, but this episode solidly presents him with a greater level of intelligence than an ordinary animal would have. It’s surprising that a series with as many info-dumps as Aria the Animation has had wouldn’t have commented on this outright. Looking at his actions, President Aria has an intelligence comparable with a young human child. He tries to help out around the house, but only causes trouble. He can type a letter in plain English (er, Japanese). He tries to run away, but fails at this, too. He makes a mess of things trying to cook a meal. He even plays the role of a superhero. 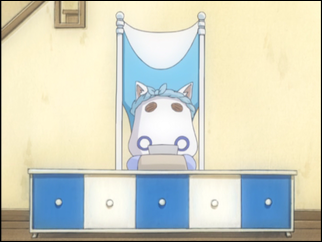 Over at Himeya Company, there is President Himeya. She’s a lot more “together” than poor President Aria, keeping composed and respectable. She acts more as a figure and less as an actor, by what little has been shown of her. She’s all about show and presentation. I again wonder how it’s decided which content goes into an episode. I’m going to figure that all 13 episodes are based on stories from the source material, material which can have any number of chapters without having to meet the same strict episode requirements a television series requires to fill a season. Given a limitless number of stories, it could be interesting to see how President Himeya spends a day. If Aria and Himeya have child-like intelligence (although Himeya’s appears higher), what does this say about President Maa’s future? (Considering how he is around President Aria in the present, I almost want to write his name as President Maw…) Will Maa have the same (general) intelligence as the other two? Is this intelligence something all cats have? Or all blue-eyed cats? Or only certain species of cat, regardless of eye color? A side conversation, a meeting, an introduction takes place with no fanfare, as the viewer greets the A-name of the underground, Al the Gnome. I like him already, and hope he’ll appear in another episode, as Akatsuki has had an episode with a large role, and Woody…well, he has some screen time, at least. While Akatsuki has his calling to hear Alicia’s recording, and his time being guided around by Akari, only to treat her to a snack as thanks, the same can’t be said for Woody. We’ve seen Akatsuki’s brother, alongside learning that Akatsuki isn’t the most financially secure right now. Woody, we know only as a good friend of Akari’s. Will Al be seen as simply a friend of Aika’s, and that’s the only link that puts him into a later episode? It’s easy to let third-class characters remain unutilized with a low episode count. What I wouldn’t want to see, on the other hand, is a “character episode” simply for the sake of using a character, only to (essentially) ignore them for the rest of the series. In Seven of Seven, each main cast member gets their own spotlight episode, but before and after they remain as one of a large cast, with little standing out. I’d rather see a consistent use of characters when it makes sense to show them, and Aria the Animation is doing this right. It’s the low episode count that’s the problem. If the manga makes more use of these characters, I’d have to look into buying the source material while waiting for the next animated series to be released by RightStuf!. Thanks to the on-screen text (which uses a very nice font and design, drawing my eyes right to the English subtitles without my noticing the Japanese behind them), I missed a lot of the dialogue between Aika and Al on my initial watching of the episode. Some other scenes with long subtitle text, such as when Aika talks to President Himeya at the window, while looking at the sunset, I couldn’t read the subtitles fully before they went away. 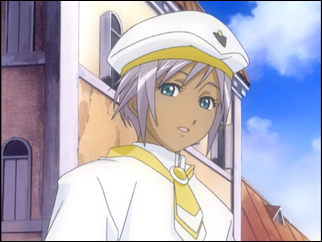 I still believe Aria the Animation to be a series that would have made for a great English dub. I didn’t notice if Athena’s name came up in the credits after the prior episode, but did notice this time around. Glory makes sense as a surname. It leaves me wondering what the reference to Aika’s surname, Granzchesta, is. 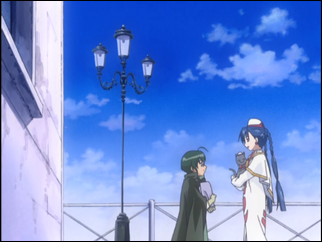 Alicia’s I imagine to be a reference to Florence, Italy, and Akari’s I imagine to be a pun. The voice actress for Athena is Tomoko Kawakami, known to me by her roles as Sugar (A Little Snow Fairy Sugar), Rika (Cardcaptor Sakura), and Yuuki (Piano). Al’s voice actress isn’t given in the English credits, but the Japanese credits lists 渡辺明乃 (thanks to the Japanese dictionary I have for the Nintendo DS, which allows me to draw in kanji and magically have it be recognized). Akeno Watanabe is known to me as the voice of Fuuko (I My Me! Strawberry Eggs), although I’d probably recognize the voice as Robin in Witch Hunter Robin had I watched the series in Japanese. As a side-note, this is one of those episodes that seems to be more enjoyable during a second viewing. I’m not sure how this works, but it does for me with this series. That’s gotta’ hurt for Woody. He needn’t feel bad, though. I have no A anywhere in any of my names. Maybe he at least has an A-surname unknown to the viewer? Woody is just his nickname. It’s hardly ever mentioned, but his real name is Ayanokohji. I can’t remember if it ever gets mentioned in the anime at all, actually. Unfortunately, he’s probably the character with the least amount of focus in the series. On the subject of cats, Aria is a special Martian breed of cat. They’re supposed to have the same level of intelligence as a human child, although they obviously can’t talk. Both Hime and Maa are simply blue-eyed cats from Earth breeds, and so are on the same level as typical house-cats. Is it touched upon in a later animated series about Aria being a Martian breed of cat? Or in the comic series? Or was this information revealed in an interview on the side somewhere? The part that had me curious with what you say is how President Himeya has dialogue attributed to her via the thought dialogue in this episode, and of course her actions and reactions in episodes. Alicia says something similar in the first volume of Aqua as well. I don’t remember the anime saying anything about it, though. I’m on the fence on whether to buy the Aqua/Aria manga. I’m finishing up GALS! right now (and I’m really enjoyed the first two chapters of book ten so far), so I’ll be about ready for a new series to read soon. Woody’s actual full name is Ayanokohji Udo the 51st – Ayanokohji being his family name and Udo his first name. So yes, Woody’s a nickname. (I got into the manga first, ARIA then the prequel Aqua, and the anime I’m finding slow to get into because I get too impatient. XD;;;; 2nd season was apparently pretty bad, esp. since they ‘changed’ the continuity to have EVERYONE there, including Ai-chan who doesn’t show up until last Navigation/chapter in the manga. It also kind of defeats the point of Navigation 46 in vol. 10, where the whole point of you not seeing the three Water Fairies altogether often is because their schedules are so busy, they tended to have only free days 2/3 to get together … so the Anime really missed the mark on that, having Athena, Akira, and Alice showing up MUCH earlier than their manga appearances. On Martian cats, it’s said as an infodump on the prequel manga Aqua that there are Martian Cats that have higher intelligence, but it’s never elaborated on whether they’re a created breed or just some sort of spontaneous mutation once cats bred amongst themselves after a few generations. President Aria is also full-Martian Cat. 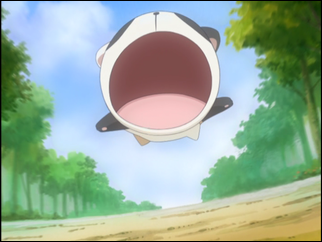 President Hime, however, is an earth cat. I’ve seen unofficial sources (wikipedia comes to mind) saying she’s a mixed breed of earth and mars cats, but since the official manga cover data says earth, I’m assuming she’s just a more intelligent earth cat. 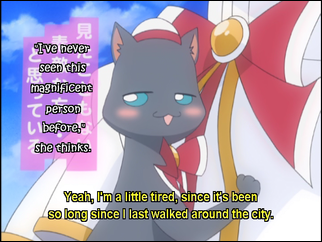 Also, in one of the manga navigations (Aria, the one on the 7 wonders of neo-venezuala), according to Athena, the old earth Venezuala had a lot of cats imported to catch mice, but such is not the case on Aqua – so the presence (apparently since colonization post full-terraform) of so many cats in Neo-Venezula has always been a puzzle. 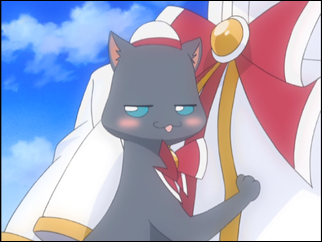 The local legend is apparently that there are so many cats because Cait Sith, the Faerie King of Cats is patron guardian of Neo-Venezula.